Financiers LOVE their acronyms more than $$. The more not obvi(ous) the better! ETFs are giving Mutual Funds (MFs) a run for their money in the popularity contest that is the stock market. Best of both worlds: ETFs allow for diversification (like a fund) and frequent trading (like a stock). 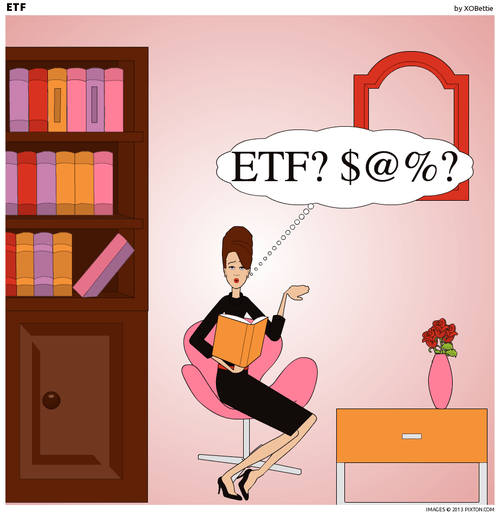 Easy access: ETFs don’t have minimum investment requirements like MFs. Good news for newbie investors. Tips: Owners have to pay extra $$ per trade. If dollar cost averaging is your investment strategy, then commissions are your enemy. Passive Action: Index investing is really the only option for these babies. You have to believe the market is efficient (and be anti-Warren). Do you believe?? When you make the MF/ETF decision…ALWAYS read the prospectus.